Winter is upon us, and so is the cold weather up here in the North East. That means cuddling up with a cozy quilt, and getting a toasty fire burning. 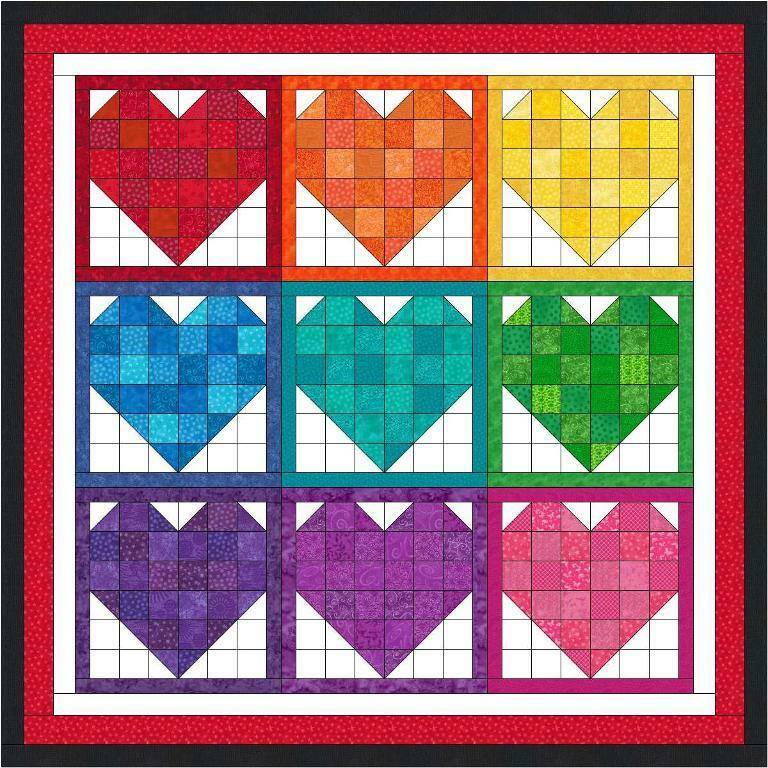 For me, it’s time to start a new quilt. 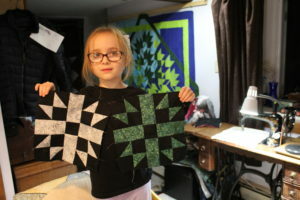 Recently, I’ve decided to teach my twin grand daughters how to sew. When they were just 5 yrs old, I bought them each a little sewing machine – more of a toy than anything else, but they really did sew! We started with sewing on paper without threading the machine – to practice manipulating the page to follow some lines – to see if we could make the machine sew where we wanted it to. 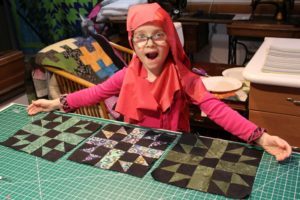 When we finally put some thread in the needle – we got busy making some simple puzzle quilts using squares and rectangles. They were so proud of their first creations!! We found an easy block that has 4 half square triangles, 4 rectangles and a center square. When the blocks are all put together, the girls decide it looks like a snow flurry. So that’s what we are calling the pattern – “SNOW FLURRIES”. I’m offering it here as a FREE download for those who want to tackle what my 6 yr olds are doing. 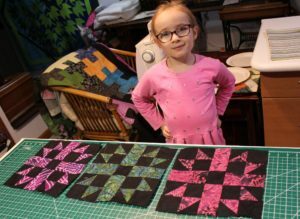 If you want to try teaching your child how to quilt; just be prepared for many moments of distraction, lots of irrelevant questions and tons of fidgeting at the machine. If you can get past all of that; it’s fun to see them learn and grow with a new skill. We try to sit down to quilt for no more than an hour at a time. Any more would be too much for a child that young. 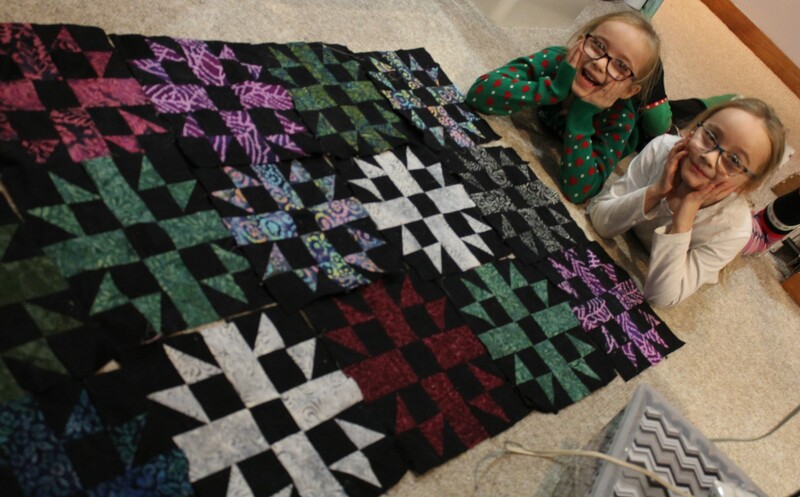 As it is, after 45 minutes they are itching to do something else – but it takes them an hour to make 1 block (at least it did at the beginning of the quilt)! 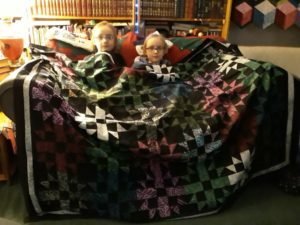 Fast forward from September 19th, to December 17th – and the quilt is done! By the end, they were each able to finish 3 blocks in an hour. 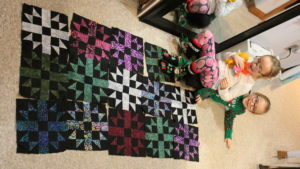 Good thing, too – as they wanted to give this quilt as a gift and time was running out! 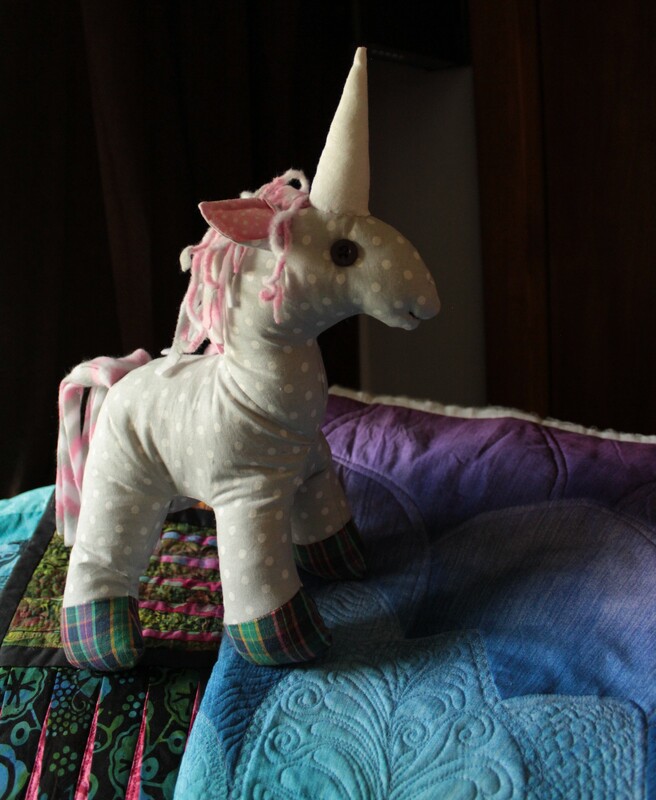 I kept the quilting simple – so it wouldn’t outshine all their hard work. This is a gift that will be cherished, I’m sure. They are happy to share their adventure. So enjoy the following pictures. 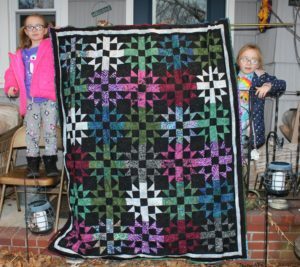 If you want to try your hand at this fun quilt, just click on the link below (“Snow Flurries Pattern”) to download your FREE copy of the pattern today! 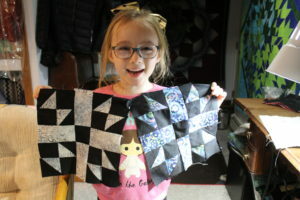 Halfway done with the quilt and progress is getting quicker – two blocks in a day! Here’s the first half of the quilt! Borders are on and it’s ready for quilting! 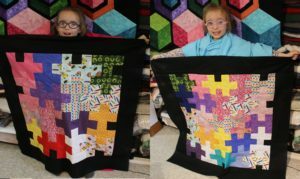 We backed it with fleece (using no batting) so it wouldn’t need too much quilting – just enough to hold it together. Click on this link “Snow Flurries pattern” to get your free copy today! 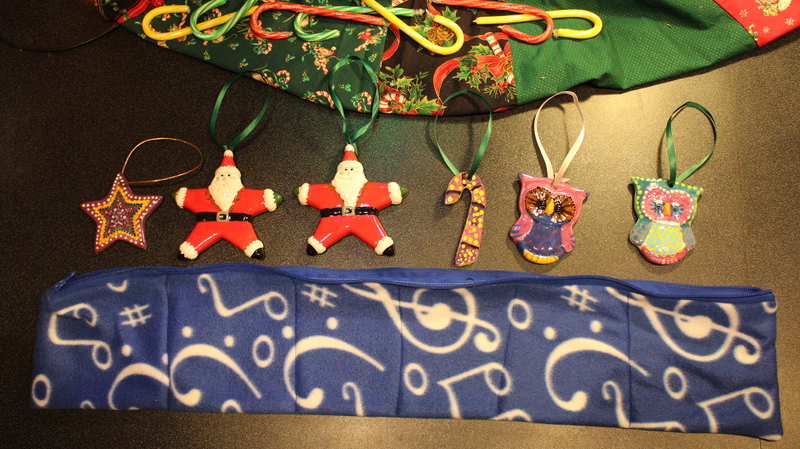 Just around the corner, the holiday of hearts will be here in less than a month. 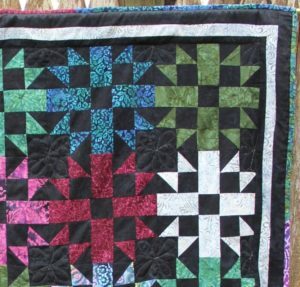 This scrappy quilt makes a great wall hanging, lap quilt, or baby quilt. I’m sure you could complete it in a single weekend! Click the link below for your FREE PATTERN!